Rose Grove must rank as one of the nosiest stations in Britain, being situated right next to the M65 motorway. It is an island platform with a blue-framed shelter. As we move away the motorway runs parallel with us for the next mile or so, whilst on the right can be seen old mills and some newer factories. We then leave the mainline to Bradford and veer left and go under the motorway. We then go into a cutting before coming into Burnley Barracks station, which is single platform with a shelter, still in the cutting. We then move out onto an embankment (and then viaduct) with views over Burnley. On the left below us a lot of redevelopment is going on with new office blocks being built. On the right is the town centre with more old mills. 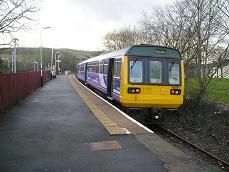 We then arrive at Burnley Central which was once an island platform but how has just the single platform on the right. It's been rebuilt in recent years and has a new building, housing the ticket office and waiting area. We pull away and veer to the left with the train's wheels squeaking very loudly. There are some new houses on the left but plenty of terraced houses on the right. We seem to be going downhill, but only at 20 mph. We pass a mixture of old and new factories on the right and wasteland on the left. Then we see some countryside with hills in the distance on the left and a canal on the right, which soon passes underneath us. We speed up to about 50 mph passing allotments on our right before we seem to be out into the countryside proper. There is a nice canal marina on the left full of narrow boats, then we go into a low cutting and come out into more terraced houses. There is a large piece of wasteland on the right and then we go over a level crossing and into Brierfield station. It has the basic blue-framed shelter on a single platform. On the left is a large Victorian office building belonging to BSN Medical and on the right is a large mosque currently being built. We go into a tunnel and emerge where there is evidence that there were once 4 track here. We go past terraced housing on both sides of the track then come to a halt at Nelson. This was once a grand station and still has a large roof canopy covering the former island platform. We use the left hand side and I notice that the station sign says "Nelson Interchange", adding to its grandeur. We then leave on a viaduct, which gives you clear views of the town, which is mostly terraced housing. We then stop for a level crossing and move off past more terraces on either side. We come onto an embankment and pass large factories on the right. There is evidence that this was once a four-track railway here as the track is very wide. We then go into another cutting and come out into a semi-rural landscape, though there are still some houses. We curve to the left now and start seeing the town of Colne with old mills and more terraced housing on both sides. Then we come into Colne station, which is a modern single platform with a lone shelter. Beyond the buffers are a playing field, a main road and houses. Only me and one other passenger are on the 13.50 return train, but it does fill up by the time it gets to Blackburn.